The sun is shining, flowers are blooming and the temperature is rising. Summer is right around the corner! These last couple of months have been a great learning experience for me and have presented me with many opportunities. I have been very busy working at Leads On Demand and the Orlando Predators these last couple of months and it’s been a great learning experience as I have been able to learn more about the ins and outs of the internet marketing business, as well as the running of a sports team. It’s been an interesting and nervous but exciting time at the Predators this last month because we are currently going through an ownership change and I have never been a part of something like this. Our previous owner didn’t leave on the best of terms as he wasn’t paying his bills, so the AFL took the team away from him and he wasn’t too happy about it. So, even though it’s a little dicey right now for the Predators, there are a couple ownership groups out there who are very interested in buying the team. It’s kind of exciting and very interesting to be of part of this kind of experience because it’s nothing like anything I’ve been a part of before. Hopefully it all works out in the end! 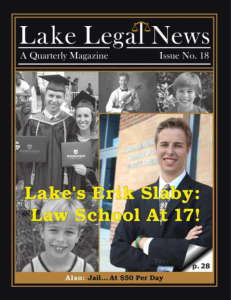 Also, in these last couple months, I got the opportunity to be the feature article and cover for a local magazine called Lake Legal News (LLN)! LLN is local legal magazine here in Lake County and I was contacted by the publisher and editor of the magazine, James Hope about working together on a feature article for their upcoming edition. Mr. Hope said that he “discovered” me by reading an edition of The Bunk Room and coming across my blog and becoming very interested in my story. I’m very excited to be a part of LLN and honored that someone in the legal community has taken an interest in my story and has read my blog. It is hard for me to know if people are actually reading my blog, so when something like this happens, I get very excited and happy that people actually are reading my blog. It also makes me feel satisfied and proud that my blog is being read and it’s an awesome feeling! ← Previous Previous post: What’s Up! Next → Next post: Quick Update!